When Tag Heuer created it’s Formula One racing watch, Monaco 1133, for Swiss racecar driver, Jo Siffert, no one could imagine that this edition would be made famous just two years later when actor Steve McQueen decided to wear the timepiece for his new film, Le Mans. And although box office sales were not great that year, the movie has since become a classic for racing fans hailed by critics. The TAG Heuer Monaco 1133 began as a brand new design concept by Jack Heuer himself, who had a vision for a great racecar timepiece. The watch was the first to automatically wind and used the Calibre 11 or chronograph technology. It was also the first water resistant chronograph timepiece for TAG Heuer. Perhaps McQueen was attracted to the impressive craftsmanship and unique blue square design when he decided to brand himself with the Monaco. We know his close friendship with Siffert also had a role to play in his choice. In 2009 TAG Heuer decided to re-launch the Monaco 1133 in a replica almost exact to the orginal. The TAG Heuer Monaco 1969 Original Re-Edition was released as a limited edition, with only 1,000 timepieces available. The watch still utilizes Calibre 11 movement with push buttons on the right hand side and a crown on the left. The stainless steel backing of the Monaco contains the engraved signature by Jack Heuer himself. 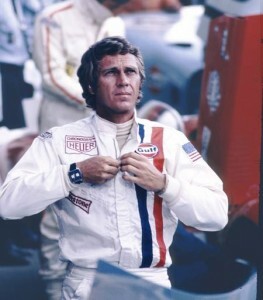 The Monaco 1133 and McQueen remain immortalized together in the film and racing communities. This watch is truly impressive! I had the unique privilege of trying one on this afternoon and, though I could not quite afford the price tag of such a rare a work of art, I will certainly not forget the experience of wearing it. Its radiant blue face gives the Monaco 1133 an instant readability and lends a look that is both sporty yet sophisticated. The Monaco’s exhibition back case lends to the singularity of this particular time piece, showcasing it’s exquisite swiss movement. Looking at this watch on my wrist, I could instantly see many reasons why Steve McQueen might have chosen it to express his character for that iconic racing picture.